Wind can do some major damage. This is a 6 inch stick that is pierced through this roof system. Call for a free inspection today if you think you sustained damage. Hail, fire, smoke, water and more — dealing with insurance claims after your home or business has sustained damage. When your home, business or commercial property has sustained substantial damage, such as from a hail storm or a fire, a thousand worries and questions whirl through your mind. Who’s going to fix it, and when? For businesses and commercial buildings, there is the real possibility of a heavy financial toll in lost productivity, as well as the emotional strife. Full participation with you and your insurance company and insurance claim adjuster. 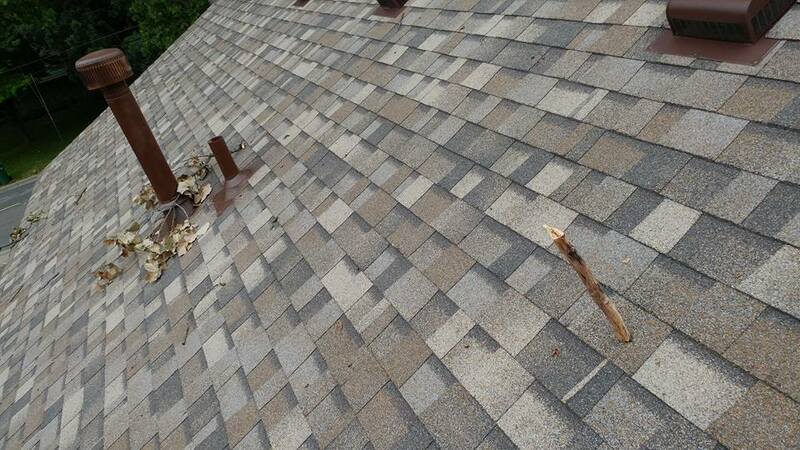 FREE inspection of roofing system and home or business due to damage caused by hail, storms, fire, water and more. FREE itemized list of damage and estimated costs for repair, restoration or replacement provided to the homeowner (or business owner) and insurance company. FREE and fast assistance submitting your insurance claim. The professionals at Innovative Building and Design will work diligently with you and your insurance company to help you get your home, business or commercial property back to pre-damage condition. Any time your home or commercial property experiences a hail storm, or you notice roof damage following wind-driven storms, your roof should be inspected — not neglected. No one likes to go through an inspection and repair process, but it may prevent more substantial damage down the road, as the damage only gets worse — never better. Hail impacts don’t always leave evidence, such as pock marks. However, hail may damage underlying materials and fasteners that the eye can’t see. If your home or business has been damaged by fire, smoke, soot, odors, water, mold or other disaster, you should contact a reputable contractor to perform an inspection and estimate of the damages. At Innovative Building and Design, our inspectors are experienced and thorough. We provide FREE estimates, and inform you of your options of how to proceed. For help with your home or business insurance claim, contact Innovative Building and Design today at 612-808-6025.